Save even more on outdoor clothing and gear with Sierra Trading Post coupons and free shipping codes. 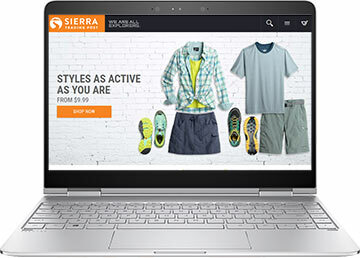 Although they have great deals and cheap prices everyday, sometimes there are Sierra Trading Post promo code offers, which you can find on this page, that can help you get additional discounts or free shipping. When you spend a lot of time in front of the computer, you want an in-home outlet mall. Why drive miles to the nearest outlet shopping center when you can log on to www.sierratradingpost.com for seconds, overstocks, and closeouts? At Sierra Trading Post, you’ll find discounts of 35-70% on clothing, home décor, adventure gear, outdoor recreation products, and footwear. Shop discounted products from nearly a thousand name-brand manufactures, from Adidas, Body Glove, Chaps, Disney, Eagle Creek, and Field & Stream to Moving Comfort, Oscar de la Rental, Pacific Trail, Quicksilver, Speedo, Vanguard, and Zelda. Need to stretch your legs after a long day of tinkering at the desktop? Do it in comfort and style when you buy footwear from Sierra Trading at outlet prices. They stock men’s shoes, women’s shoes, winter boots, hiking boots, sandals, slippers, clogs, and socks. Some of their customers’ favorite brands include Keen, New Balance, and Chaco. In case you sometimes like to take a break from all the technology and get outdoors, the Trading Post retails hunting clothes (shirts, socks, jackets, vests, and baselayers) and hunting gear (stands, blinds, decoys, gun cases, sleeping bags, sleeping pads, hunting packs, hunting knives, shooting equipment, binoculars, and scopes). If fishing is more your style, they maintain a vast inventory of fishing tools, fly rods, fishing rods, waders, fishing boats, flies, lines, and leaders. Even if you’re not into killing what you eat, you can still experience the great outdoors by camping and hiking with great gear from SierraTradingPost.com. They have water bottles, camp furniture, outdoor cooking appliances, flashlights, headlamps, water treatment devices, tents, sports watches, and polarized sunglasses. Geeks may not have a reputation for great risks, but in this world of mindless conformity, to be smart is to be edgy. Want to push that edge even farther? Visit the Sierra Adventure Edge Specialty Shop, where you’ll save big on climbing, cycling, snowboarding, skiing, skating, watersport, fitness, and surfing equipment, gear, and clothing. Unfortunately, life can’t be all outdoor fun. Sometimes you have to work. But after slaving away at your office cubicle, it’s always a relief to return home. Make your home your castle with cool designs in bedding, bath, and home décor products. Sierra Trading Post will furnish you with unique and inexpensive window treatments, wall décor, rugs, carpets, seasonal décor, furniture, and tabletop décor. Eventually you’ll probably have to leave home to travel, however, so when you do, take a look at this discount outdoor sporting goods store’s selection of affordable luggage, toiletry bags, travel pillows, carry-ons, briefcases, garment bags, travel backpacks, and duffle bags. No doubt you always carry your laptop with you, so you’ll appreciate the Trading Post’s assortment of laptop totes, including the Timbuk2 Classic Laptop Sleeve.